After living and working in England, Germany, Sweden, Spain and Greece, Helene Steene has found a new challenge in our local arts community, which seems to have encouraged her to embrace the enduring, eternal, everlasting, permanent and perpetual nature of the human experience. This statement might surprise Steene, because it is not at all how she describes her work. In her words, her method of artistic expression allows her to remain somewhat detached from the social sphere and immersed, for her sake and ours, in the serendipitous and the ephemeral. Through layering and more layering of marble dust, sand, metal, acrylic and wax, and oil, Steene presently creates colorful, abstract collages adhered to a 2-dimensional surface of constructed wooden boxes; these surfaces are increasingly growing in size. She works intuitively in search of a harmonious balance between different techniques and materials. "When working on a piece, and the colors, textures, lines and strokes start to speak to me, then the dialogue between the work and myself is all that matters," reads Steene's artist statement, which goes on to underline that her goal is to realize this harmony in order to connect us to the "greater mysteries in life." I contend that Steene's work is moving beyond this sort of disconnected autonomy often associated with "high art"; in her struggle to balance a purely aesthetic experience with the tastes and pleasures of our unique Kentucky context, her work is beginning to embrace a new dialogue. 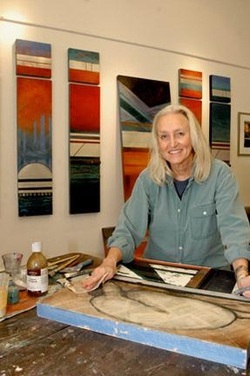 Steene began making art as a sort of hobby without the intentional pursuit of a career until she enrolled at George Washington University in 1976. There she mastered the art of figure drawing and later painting in a highly expressionistic style. She acknowledges the influence of Japanese born artist Kenzo Okada (American, 1902-1982) and his lyrical abstractions of the sublime, and the artistic journey of Richard Deibenkorn (American, 1922-1993), whose work progressed in much the same manner as Steene's. Both artists used a method of layering one material upon another to reach their aesthetic statement. Since her time at George Washington University (1976-79), Steene has been layering materials and techniques that, in her words, connect her to an ancient past – namely marble dust from the Greek island of Paros and the use of encaustic. For many, Steene's life experiences, education, artistic skill and chosen materials build a sense of credibility and richness that imbue each of her objects with intrinsic value. However, Steene now sees that the very process itself of layering these disparate elements has the potential to reveal something about life and people. "Layering intrigues me visually, but for me also represents life and people, where you discover the truth by peeling away the layers, and to find what is hidden." Since enrolling in the graduate program at the University of Kentucky in 1999, her work has begun to integrate materials and techniques that speak to the enduring nature of human experience; two faculty members in particular, Ross Zirkle and Arturo Sandoval, set Steene's work on a path of transformation. "I think a major transformation occurred in my work back in 2003 when I had planned to do a series of large oil monotypes for my Master of Fine Arts show, but the print studio was just too messy, and it would have been difficult to work on this series I had in mind. I needed a lot of clean space to spread out these huge sheets of paper, so I was a bit frustrated," Steene said. Her frustration took her to the larger spaces of the drawing studio where she began working with Ross Zirkle. Under the influence of Zirkle, Steene began to incorporate older and deconstructed figure drawings into works like "Vessels," "Dance II" and "Woman." In her words, the process and works "became richer – almost with a soul." For Steene, Zirkle was a very good soul to be around, almost a soul mate of sorts. In fact, she named a piece after Zirkle, "The Shimmer at the Edge," because it seemed an important lesson at the time and a good philosophy for life. The lesson was everlasting as it taught her to be aware of the importance of what happens when not only lines and colors meet, but when people meet. Zirkle was one spiritual connection in this new journey, as was Arturo Sandoval. "I think Arturo Sandoval's encouragement to work with mixed media, free-hand interlacing and all that, is what lead to my love for collage," she said. "Contemplation," "Serenity" and "The Golden Valley" are some of the first collages she produced under the guidance of Sandoval. While these works mark a new direction for Steene, their titles are still rooted in the very noble goal of presenting to us the greater mysteries in life. Since that time in her artistic career, Steene's materials have not always been so intimately connected to the traditional methods of artistic practice or the ancient past. Sandoval encouraged her to collage whatever material she could and push the boundaries – shortly after aluminum plates made their way into many of her works. "It was the metal I had used as my print surface when doing mono types, I loved the ghost prints that started to build up, so I wanted to use them in the actual work," Steene said. The intrigue with metal advanced to engage with the qualities of the material itself, often working it until she achieved just the right surface texture and light; more importantly it was a new way for Steene to "capture the viewer." These experiences in the graduate program at UK seem to indicate that the work was no longer about serendipitous harmonies between materials and form alone, but rather built with particular life experiences. The richer works now require from us and by Steene a more open dialogue. I contend that occupying and actually working in a studio space at the Lexington Art League's (LAL) Loudoun House has been informing this new dialogue. In fact, Steene readily admits that her work changed when she moved into a studio space at the Loudoun House in 2003. If for no other reason than she simply had the space to really work and experiment. It has also resulted in a new desire to work larger and, again, connect to her viewer on a different level. "I am personally always pulled in to my work, partly because I am so close to it, whatever scale, but something about huge scale speaks louder, obviously. Just the size and my colors tend to stop viewers and then pull them in to discover the subtle work. So it is that something about being 'big and loud' scale wise, and to be able to still convey the inner calmness, but with passion," Steene said. As the shows at the LAL become more and more thought provoking, Steene admits that she partakes, metaphorically speaking, in a kind of "discussion among artists and myself, even when they are not present." Steene knows well that the visual language can act as a "bridge" between cultures and people, but still states formally that the intellect plays a lesser part in the formation of that bridge. Her artist statement ends with the following: "I am convinced that one's range of intellect is so trivial in the face of greater mysteries." Could it not be that this bridge must be built with both the spiritual and intellectual, and that this new dialogue between artist and viewer, between cultures and people, is vital to our understanding of the greater mysteries of life? Steene's rich and meaningful experiences in our Kentucky context have poised her to peel away the layers and continue to embrace this challenge.